For high brines conditions in fracturing, SINOFLOC team synthesized the anti-temperature and salt-resistant fracturing fluid thickener with acrylamide monomer and AMPS and by using free copolymerization of an aqueous solution. The optimum conditions of synthesis were determined by lab experiments. The results show that the fracturing fluid has excellent resistance to temperature and salt resistance, and has the characteristics of shear resistance, which is completely broken and the less residue of the filtrate and also less damage to the formation. At present, many oil fields have entered the enhanced oil recovery stage of high water cut stage. Lab experiments and field test studies have shown that polymer flooding is an effective way to improve oil recovery, and has broad application prospects. However, although the most commonly used polyacrylamide has a certain oil displacement effect, the viscosity of polyacrylamide decreases rapidly with the increase of the mineralization degree of formation water. At the same time, the oil well temperature of the oil layer is higher and the thermal stability of polyacrylamide is affected. 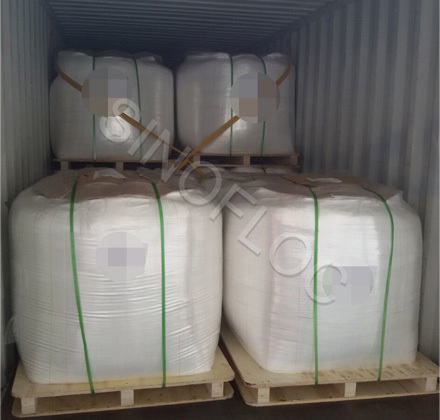 In addition, in the polymer solution injection process, the bottom of the hole when the perforation of the polyacrylamide will cause strong shear, will lead to polyacrylamide molecular chain fracture, the apparent viscosity greatly reduced. Therefore, polyacrylamide in the high salinity, high temperature, and high shear, the oil displacement effect is not ideal. SINOFLOC R & D team was modified with acrylamide and 2-acrylamide-2-methyl propane sulfonic acid (AMPS) as the raw materials, and free radicals hydrophobic associative polymer was synthesized by micellar polymerization. The molar ratio of AM and AMPS, the content of hydrophobic monomer to the intrinsic viscosity of the polymer and the apparent viscosity of polymer solution were studied systematically. The effects of the molar ratio of initiator and reducing agent, the molar ratio of AM to AMPS come to the appropriate reaction conditions. AMPS and the introduction of hydrophobic groups can improve its temperature resistance and hydrolysis resistance. The polymer can improve the water flooding ideally when polymer flooding, and also promote the application of the polymer system in different salinity and temperature reservoirs. For more detailed information, please feel free to contact marketing@sinofloc.com.